The Lo Zone – Pop-lockin' thru pop culture and life. NOW AVAILABLE: The Audiobook of ONCE UPON A TIME IN COMPTON! What’s poppin, y’all!!! 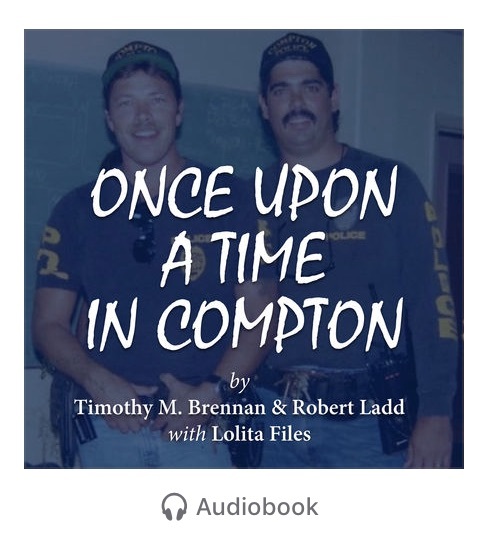 Check it: My book Once Upon A Time In Compton, co-authored with former gang unit detectives Tim Brennan and Robert Ladd about their wild and outrageous adventures during an epic 20-year era in the city of Compton is NOW AVAILABLE AS AN AUDIOBOOK, with yours truly (moi) narrating!!! Spread the word! Give us a listen! We cover it all, from Tim and Bobby’s times with the members of N.W.A and DJ Quik to their involvement in the Tupac and Biggie murder investigations, and more! Imagine my soothing, alluring, yet also 🔥🔥🔥 and EXCITING voice personally regaling you with this incredible tale. You can turn me on and off at will. But you won’t (turn me off). You’ll wanna listen to me read to you FOREVVVVVVVAAAAH. And I’ll do it. Just for you. Because that’s how I am. Just press “play.” I got you, boo! Available on Amazon (Audible) and iTunes RIGHT NOW. And don’t forget the paperback and Kindle versions – recently republished by Tim, Bobby, and me – are also available! Can you hear me singing those words? Because I’m singing ’em. More like sangin’ ’em. Tomorrow – Tuesday, November 21, 2017, from 9pm-11pm both EST and PST (8pm-10pm CST) – our six-part A&E docuseries Who Killed Tupac? premieres with two episodes back-to-back. I am beyond excited for everyone to see it. We went deep. We wanted answers. We wanted justice. We felt Tupac deserved the due process he never received. It’s been twenty-one years since his murder. The time for answers is now. Check out this sneak peek from the series and be sure to tune in tomorrow night and for the following four weeks as it all goes down. Interact with me on social media. I’ll be talking about the show throughout its entire run (and, I’m sure, beyond). You can find me on Twitter at @lolitafiles, on Instagram at @lolitafiles, and on Facebook at www.facebook.com/lolitafiles. …the six-part A&E docuseries Who Killed Tupac? will premiere on Tuesday, November 21st, two days before Thanksgiving. Can’t wait for the world to watch. Our investigative team, headed by leading civil rights attorney Benjamin L. Crump, put our heart and soul into this, as did everyone involved with the production. Just seven days away. Come ride with us!!! Once Upon A Time In Compton Wins Best Nonfiction Book! …written with former Compton gang unit detectives Tim Brennan and Robert Ladd about their nearly twenty years working the streets of Compton and first-hand involvement with – among many moments in pop culture history – investigating the Tupac murder case, won Best Nonfiction book at the 13th Annual African American Literary Awards Show in New York City this past weekend. My co-authors and I are thrilled about the win and how enthusiastic readers have been in their responses to our book. We’ve got more on the horizon for this story. We’ll keep you posted as things unfold.